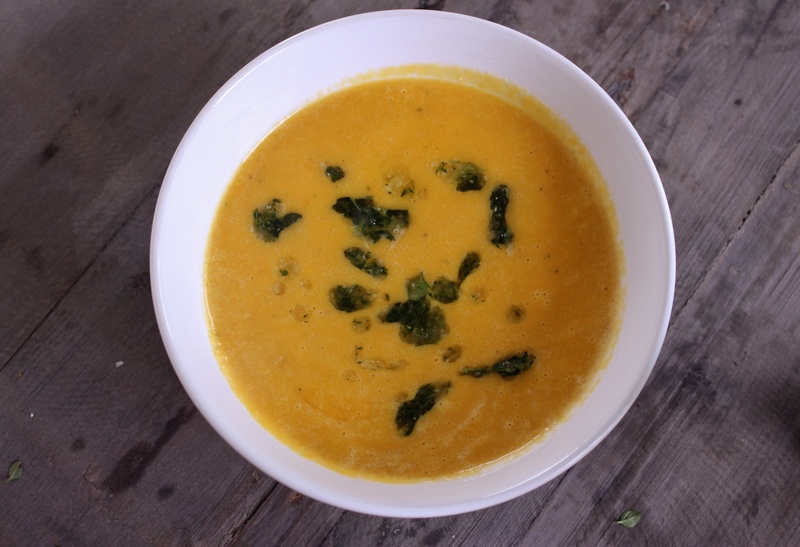 Butternut squash soup, with thyme pesto oil | dash.drizzle.dollop.devour. Soup is the ultimate winter soul food. Nourishing and sustaining, with endless varieties, I never get bored with it. This soup was borne out of pretty much the entire contents of my fridge – a squash, a couple of shallots, a carton of chicken stock and a little double cream. It was frankly a pretty bare fridge, but I had no desire to head out to the shops and this was the first thing that came to mind. I guess thats the joy of soups, there are no rules, you make make a soup from practically anything. Start by roughly chopping 3 shallots and sweat them over a medium low heat in a knob of butter and a splash of olive oil for 5-10mins, stirring from time to time and trying not to let them colour. Meanwhile peel, deseed and cube 1 medium squash and add to the shallots. Add 500ml chicken stock, bring to a simmer and cook for 15mins or until the squash is cooked. Blitz with a splash of cream, salt and pepper to taste. I have a small collection of herbs in the garden and thyme is one of my favourites. My little herb garden can bolster so many simple recipes and turn them into something more interesting. Thyme is pretty hardy, very low maintenance, a reliable plant all year round. And growing my own saves me from buying even more of those fiddling little supermarket herb packets, destined to turn to mush in the bottom of the fridge before I can use them up. Gently crush a clove of garlic with some sea salt in a pestle and mortar. Just bash it a couple of times, enough to release the oils and to squash the edges a bit, then pick most of it and discard, so you just have the garlicky flavour left behind. Add the leaves from a good few sprigs of thyme and grind together. Add 2-3 tbsp olive oil, about 10-15g grated parmesan cheese, so you have a fairly thick oily paste. Add more oil if you’d prefer. If you have some pine nuts, gently toast in a dry pan. Drizzle the thyme oil over the hot soup and sprinkle over a few pine nuts.